Get ready to make your words, pictures, and layout look as good on screen as they do in your imagination, without any code. Knowing how to use WordPress is an empowering and essential business skill in today’s world of writing, editing, collaborating and publishing online content. This is a four-part webinar series that will teach you how to use WordPress, the world’s leading content management system and blogging platform. It’s ideal for editors, writers, and anyone who needs to have a website or blog. This series is foundational and covers everything that you need to know—no matter what type of website you wish to make. By attending this webinar series, you will be able to create a WordPress site. BONUS: Taking this series entitles you to a one hour private consultation with the instructor, Bud Kraus. This webinar is geared to editorial and communication professionals who are at any stage of their career but who have little to no knowledge of WordPress. Get lots more information about this webinar. Here is why you should learn WordPress. 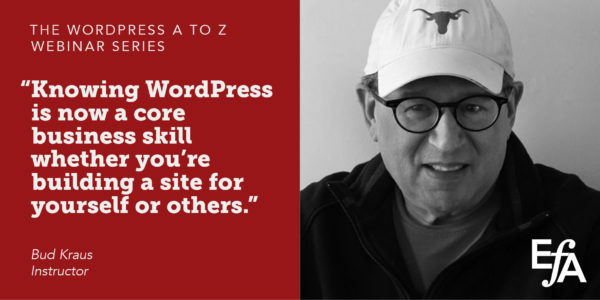 Instructor bio: Most WordPress site developers are not instructors and not really interested in teaching WordPress to clients that want to learn it. That’s what makes Bud Kraus very different. As he likes to say, “I don’t just make web sites. I teach too.” WordPress is the ideal way to make a web site whether you want to do it all by yourself, have some outside help or let someone, like Bud, do the entire site. Bud brings over 20 years of experience teaching best practices with WordPress (in New York City and beyond) to every project he gets involved with. From startup sites to site re-designs, it is his experience and professionalism that clients have come to depend on. No matter the project, Bud is willing to work with clients the way they want to work and not the other way around. He finds the best ways to collaborate with others to accomplish their goals. He always encourages every student to learn whatever they want with WordPress. His students have become web site customers, and some web site owners have become his students. WordPress is the ideal web site making software for anyone who has to bend words and phrases for a living. It’s no accident that it’s called “WordPress.” Bud is very active and well known in the WordPress community in and around the New York City area. Bud has taught WordPress to many authors and editors in recent years including members of Editorial Freelancers Association and Editors Canada. His webinars demonstrate the fundamental skills needed to make any kind of web site.